LoL reading Love Celeb now ... in Mandarin ... I just can't wait for the English scanlations to come out =). I DO NOT DRAW doujinshis, so I don't claim ANY credits for it, I got the original doujinshi from Maitake, so please refer there for the original version, I'm just translating for those non-Japanese readers =). So don't ban me for it =(. In the word bubble where Shizuru said, 'Well, how about Natsuki say, "Please let in already"' In Japanese, Shizuru said, 'もう, 入れてくれ' [Mou, Irete kure] which could mean please let in already or please put in already. 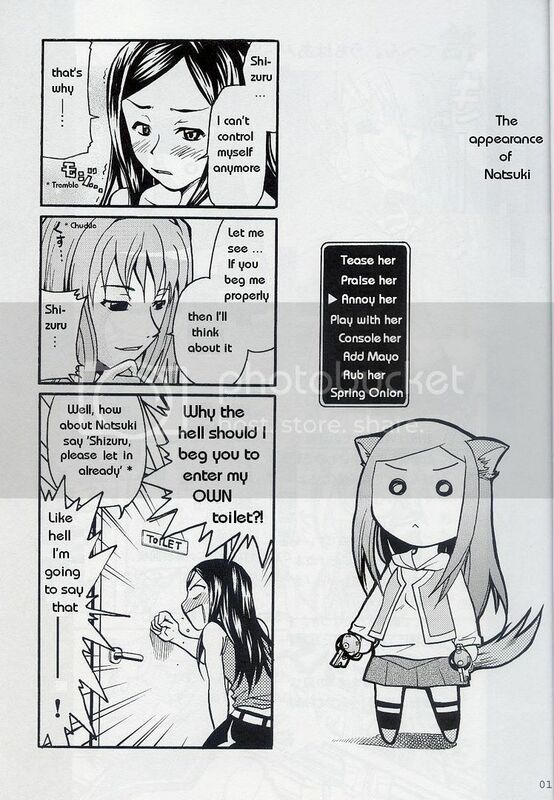 No doubt, Shizuru meant the latter lol, but in that situation, Natsuki demanded to be 'let in' in the toilet. Sorry if the meaning wasn't conveyed, hope the explanation makes it clearer here. 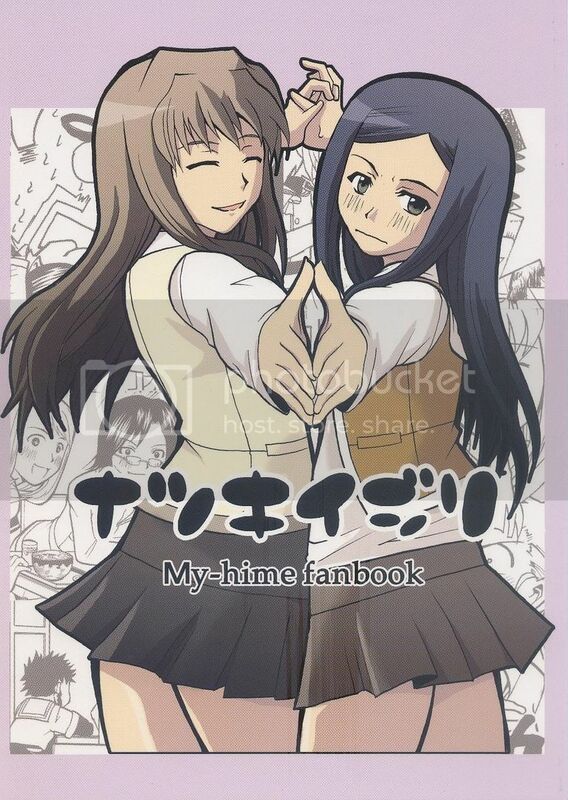 Oh, I've uploaded the ZIP file of English Translated GALP Mai Hime Doujinshi [12 Pages] by Shirinikohu in sendspace, click here for the link. Similarly, I've updated the link in the Manga Page =). Edit: I've updated the Strawberry Panic! Magazine Scans album, click here for the link. I've uploaded Dengeki G's July 2006 and September 2006 issues SP scans, no August 2006 scans cos I don't have it. In case you forget, the password to the album's my nick =). Yipee! Thanks for translating Maitake fanbook. I'm looking forward to seeing the rest of it. And uh yeah, it would be great if you translate the Urahime pages that you have. I would love to know what they are saying other than just me oogling at the pictures. You are totally awesome for translating this and a lot of the tours, so thank you. And it would be really cool if translate the Urahime, too. to Aquamarine & anonymous, welcome, hope you enjoy it. Ehhhh, it'll take a 'long' time to translate Urahime though ... once a week ... late saturday night ... lol. No promises though. I'll try and probably release it as one zip file, my blog's rated PG-13 afterall XD. Ah, the Maitake fanbook! Yay! Say, i've been trying to buy this book but am having no such luck. Any idea where I would order it or something?